Tru School Sports: Would You Want Your Favorite NFL Team To Draft Jadaveon Clowney? 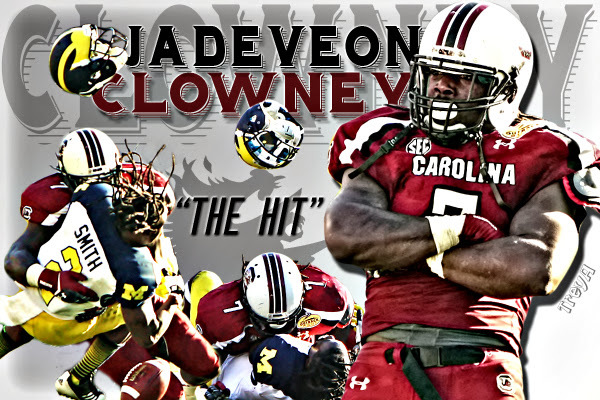 Would You Want Your Favorite NFL Team To Draft Jadaveon Clowney? Ten months is all it took for Jadaveon Clowney, South Carolina defensive end, to go from being the projected number one overall pick in the 2014 NFL Draft to a player that NFL teams might be afraid to draft. When football fans and NFL teams watch Clowney play, there is no doubting his talent. He has made some great tackles when he is able to pressure the opposing quarterback or running back. It also helps that Clowney is six-feet, six-inches and weighs 274 pounds, according to his player profile on ESPN.com. With that size and great speed, a 40-yard dash time of 4.5-according to Rotoworld's Senior Football Editor Evan Silva, it is tough for offensive players to block him. He can easily maneuver himself past offensive linemen and overpower running backs or fullbacks that try to block him. Ten months ago, Clowney delivered one of the greatest hits on Michigan running back Vincent Smith, that forced Smith to fumble, which Clowney recovered, during the Outback Bowl. The play was so explosive that it became a YouTube sensation and many people believed that he would be the number one overall pick in the 2014 NFL Draft. Clowney faced huge expectations coming into the 2013 season and he has failed to accomplish them, thus far. He had a huge hit against Tennessee running back Rajon Neal on Oct. 21, that made people remember why Clowney might be the potential first overall pick in the 2014 NFL Draft. Part of the reason he has not been able to accomplish those expectations is due to injuries. The injuries include: bone spurs in his foot and bruised ribs, according to the Associated Press. It is tough to play while battling a bone spur because of the immense pain an athlete feels in his foot when he moves. NFL teams and scouts are typically satisfied with a player missing a game because of a severe injury. However, they do not condone a player missing a game when he is cleared by the team's medical staff, according to ESPN's First Take. NFL experts have mixed opinions about Clowney's 2014 NFL Draft stock. Two positive reviews came from an NFL personnel executive and an NFL scout. According to Eric Adelson of YahooSports.com on October 8, "One NFL personnel executive told USA Today that 'no one will care' about Clowney's issues this season. And another NFL scout told Yahoo Sports that Clowney "looks like a pretty damn good college player to me.'" Two negative reviews came from NFL.com's Gil Brandt and a NFL personnel executive. "To me, it doesn't look like Clowney put in the necessary work over the summer to be in top shape," Brandt said. "Through the five games Clowney has played in this season, he has not shown the intensity or the consistent effort needed to play a physically demanding position. I think that's an issue." Defensive end Julius Peppers had similar concerns heading into the 2002 NFL Draft and the Carolina Panthers selected him second overall. He has had a very good career, thus far. The Jacksonville Jaguars, Tampa Bay Buccaneers, and Minnesota Vikings would have the first three picks in the 2014 NFL Draft if the season ended on Monday. All three teams have numerous needs in the upcoming draft including the defensive line. The sky is the limit for a player as talented as Clowney. Numerous players have excelled in the NFL after countless NFL personnel doubted their work ethic or other personal aspects. It is very possible that Clowney will be selected by one of those three teams in the 2014 NFL Draft.